Our printing capabilities are flexible, and have the ability to serve various customer printing needs simultaneously. 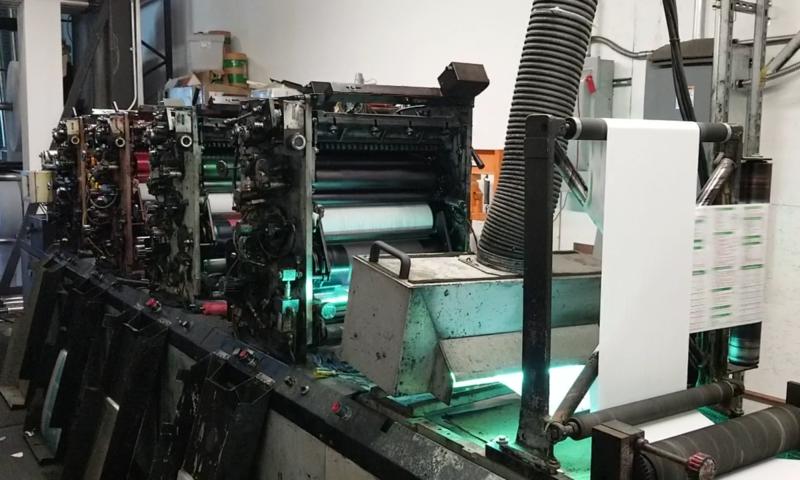 The Didde DG175 eight color Miniweb press has options like in-line perfing and slitting. The King Jet press is very useful for printing converted envelopes ranging from sizes #6-3/4 to 9 x12 booklet envelopes. The press production workflow is computer-to-plate (CTP), utilizing Kodak Prinergy Evo and ECRM MAKO 4 CTP, meaning computer digital files are processed to plate files online without the use of any film. The CTP workflow enables our offset printing process to produce vivid colors, sharper images (up to 2,400 dpi and 200 lpi), and is also an environmentally-friendly option compared to traditional film output workflows. Our laser department features the Xerox Docucolor 8080 digital color press and the Kodak Digimaster 9110 digital black press. The 8080 is capable of laying the image and variable data simultaneously, thus saving you time and money. Your imagination is the only limit to this machine. You can now have your variable information in color, and print customized images per sheet on almost any substrate. The 8080 can handle duplex sheet sizes up to 12.6” x 19.2”. The 9110 features rapid image processing with speeds of 110 PPM. It offers inline stapling, and has three large drawers that can hold 1,000-2,000 sheets of paper at once. All of the laser department’s staff are specially trained and are certified technicians. Laser printing is the heartbeat of our company’s daily operations. We offer a full range of utility services including merge/purge, de-duping, gender coding, database matching, list enhancement and more. Save postage by merge/purging your lists by finding and eliminating duplicates. Our software will handle consumer lists, business lists and mixed lists. You will always receive complete and detailed reports on every merge/purge run. We have sophisticated matching software that can take any list and match it against any other list using name/address components and phone numbers. The resulting matches can be used for updating, enhancing/appending or suppression purposes. Cyber Solutions provides several mailing services for your direct mail campaign. We can handle your job whether it is a small print and mail job or a massive mailer. Through our knowledge of postal regulations and sorting procedures, you’ll receive the lowest postage rate available while also having the most accurate list possible. We use industry standard mailing software that sorts your list according to postal regulations. This decreases the amount of work the post office has to do, which results in the lower postage rates. Our production floor is equipped with a Baum folder. It has right angle folding capabilities and in-line scoring, perfing and gluing. Special folds like “Gate Folding” — which is often used for brochures or pamphlets, and standard folds like the “Tri Fold” for letter mail, are typical applications in our production capabilities. “Slit and Nest” feature is also common practice with letter mail. Our staff is dedicated to ensure your mail piece is folded to specification in the timeliest fashion. Folding is quick, accurate and efficient; the Baum folder has a folding capacity of 10k/hr with very little spoilage. Handwork and custom assembly is expertly done by our staff. Typical applications include: non machinable envelopes, promotional packets, gift packs, fulfillment assembly, labeling, hand matching, and multiple piece insertion. We welcome complex jobs as they are handled by our reliable Handwork department. Cyber Solutions has an inserter on site. We run a Pitney Bowes Mail-Stream envelope inserter, and feature 4 to 8 pockets. The inserter is capable of inline sealing and metering. A maximum capacity of 35k pieces can be inserted within an 8 hr shift. Our inserter can stuff letters into commercial envelopes like #9s, #10s, 6 x 9 booklets, and as small as #7-3/4 size envelopes. Our reliable operators take the utmost care in making sure your mail piece are presented in professional and in the insertion order of your choosing.